Posted on 10/3/2009, 6:00 am, by rackycoo, under Halloween Costumes, Holidays. Walking around all night trick or treating can get tiring, especially if you’re a tiny gnome. Luckily this fellow was able to hitch a ride on a snail. 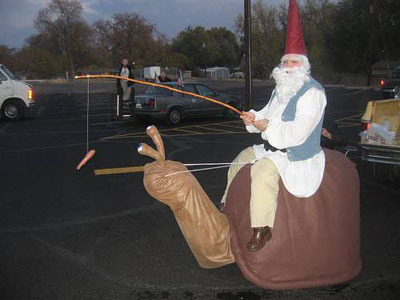 Snails are notoriously pokey, though, so this smart gnome has a carrot on a stick to help motivate his reluctant steed. Giailh created this fanciful costume for her husband. Oh man, this is the best costume I’ve ever seen. This makes me so happy! I love him! Reminds me of the racing snail on the Neverending Story! Hi, I also love the Toy Story movies, awesome film!